Union Special 39500 High Speed Curved Needle Over Edge Machines. Very popular range of Overlock Machine in the 70's & 80's. Built in the United States by the Union Special Corporation. Especially popular in the Lingerie & Knitwear Trades. 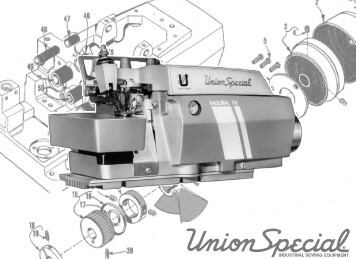 Need Parts or Needles For Your Union Special 39500 ? Call Us, we can help. Parts for these machines are now getting quite difficult to find. But we hold all 'High Mortality' Parts for the UNION SPECIAL 39500 here in stock. We are also able to source other parts on a 'Special Order' basis. This is a selection of what we can supply for these machines so if the part you need is not shown or you are unsure what you need, check out the PARTS BOOK or call and we'll be more than happy to help out.